I think the lights went out when he died. I still put them up every year, but I can never get them to turn on, never get them to glow. Pike just had that touch, you know? It was like anything he touched wanted to please him, wanted to make him happy, wanted to see him smile. And what a beautiful smile he had. The tree in the corner of the living room, near the glass patio doors reminds me of him. It has that heavy, woodsy, slightly musky scent that all women seem to like on their men. But Pike never smelled that way unless he’d been rooting around looking for Christmas trees. He’d come home from fetching a tree, snow all over his clothes, go tromping through my living room, and then he’d drag that tree across my floors. He always left a trail of slush and needles for me to clean up, scratching the wood, grating the tile in the kitchen. I remember scolding him…now, I miss the mess. I pull my gaze away from the open doorway where the living room breaks off from the kitchen. Dragging another box out from behind the couch, I set it on the mahogany table resting peacefully at the foot of a rather ancient, ratty couch. His dog is still sitting there, under the table, staring at me happily, wagging his yellow tail. I grimace and nearly rip the box in my attempts to see its contents. Hopper was a puppy when Pike went away; I’m not sure he understands his Daddy’s never coming back. I begin putting the hooks on the delicate glass balls, hanging them on the tree. My arms would get scratched by the branches if it weren’t for my sweater. It’s baggy and red with a reindeer and some German writing on it. It was a gift from our first Christmas together. Pike had bought it for me when he’d gone to visit his mother in “The Old Country”–because apparently that’s what they call every place that’s not America or Asia. It’s a dingy old thing now, barely held together at the seams, but it smells like cinnamon and that keeps at bay the scent of the Christmas tree when I press my face into the woven folds. The soft smeared light of the Michigan sun is turning gold as it slides down behind the snow and trees, slipping away to let the blue and black of night slowly consume. As it does, I glance into the box. Some of the dull glass balls are already broken from rough handling. Let’s just say it’s not an easy task climbing out of our tiny little attic while carrying boxes. I’m already tired from the housework, the setting up for the holidays I’ve only begun to do. I tremble and turn my attention forcibly back to the box before me. I don’t want to do this, don’t want any of it. I’d like to curl up in my bed and stare at the night sky until I sleep, but that’s not what Pike would want for me. He would want Christmas—more than anything. And he’d want those stupid lights to work. Falling asleep at night, after a long day answering phones at the firm…it’s the only time I usually let myself conjure up thoughts of Pike. But when I’m alone with no one else in the house but his puppy to talk to, what else is there to do but think of him? I think the hardest part of remembering Pike is that I remember all the little things. Like how he always smelled a little bit like sweat, even after a shower. The way he’d drink three cups of coffee in the morning, and still whine about my questions concerning the budget. The whiney way he’d beg for ice cream when he had a cold, and the sweet way he called me “Auddie” even when I pretended to hate it. I remember coming home to trails of dirty clothes he’d left behind on the way to the shower every night. Most nights he’d end up sprawled across the bed, snoring before I could get home from the office. I remember the way he’d groan when I climbed in beside him in the dark, curled an arm around his side, and laid my head between his shoulders, listening to the faint sound of his breathing. As quiet raindrops pelt the window, I gaze outside once more. The sky is grey and blue, fading quickly. The moon casts shadows across the patio’s concrete surface, and I brush back the dark hair from my face. I need to get this work done, but I don’t want to do this. I don’t want to celebrate this holiday without Pike. Christmas is just another reminder of what I’ve lost, just another symbol of this hole Iraq has left in my life—as if there is anything it has left untouched. The phone begins to ring from the kitchen, but I ignore it. It’s probably just mother calling to whine about what an anti-social child I’ve been, since I’ve rarely left the house in the past months except for work. I keep telling her to leave me alone. I called in sick to work, and didn’t go all week. Father scolded me for it; I told him I’ll go back after Christmas. My sister, Carlene, tells me I look like the walking poster child for a death camp victim from the 40’s. I say she’s exaggerating; she says she’s not. I can’t seem to get them to understand, just like I can’t get this jumbled mess of hooks to untangle. I tell them I’m fine, that it’s just this season. I’ll be better soon. I hope. Licking chapped lips, I listen to the sound of soft bubbling from the kitchen. A batch of cider is in the crock pot. Cider was my favorite. And even though he preferred eggnog, Pike whipped up a batch of apple cider at least once every year, made from homemade spices and apples. He’d surprise me with it when I came home from work, staying up late just to make it for me. He’d be ashamed to know mine is from a bottle. Hopper yawns and then starts gnawing on the toe of my shoe. Frowning at the pressure, I give him a little kick in the snout. He yelps a bit. I’m still mad at Hopper. He broke my picture last night. My favorite picture. It sits on the rickety white nightstand beside my bed. With all the white in this house, the pictures that used to adorn every wall provided the color. Now, I’ve taken them all down. All but my favorite one, and Hopper broke it. The glass shards still remain sprayed across the upstairs floor; the picture sits in its smashed frame. 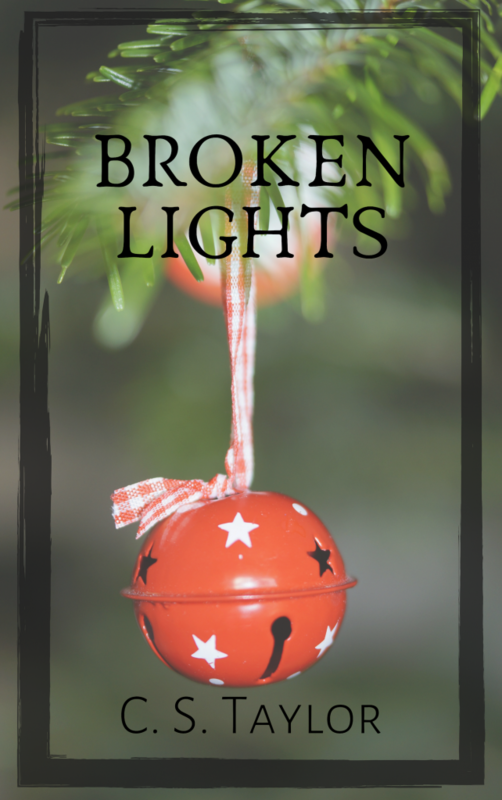 I don’t have the heart to fix the mess; that picture and its frame are like my world this Christmas, like Pike’s stupid Christmas lights—broken. That picture was beautiful. In the photograph, Pike and I were standing on a boardwalk, taking selfies with the Pacific ocean in the background. The warm waves of California’s Moonstone Bay were crashing against the shore, there were seashells in the sand for me to add to my collection, there were no people around that day. Just us. It had been where we’d spent our honeymoon, years and years ago it seems like, though it’s only been three. I smile just a bit when I remember it. Thinking of those days brings back memories. Happy ones, yes, but this season they are painful. I suppose I’m the kind of person whom you don’t wish to be remembered by; because even the way you breathe will eventually drive me insane. Or at least that’s what it’s like for me to remember Pike—his memory brings me to the borders of insanity. Everyone said Pike got the wrong end of the deal when he married Audden Parks. They said I was a foolish little slip of a girl back then, that I didn’t know what I wanted. They were wrong. I knew the moment I first saw him, standing on the side of the road by his broken down Chevrolet, I knew he was the man I wanted to light up the rest of my days. I knew he would be the sun to my universe—the light of my sky and the center of all. And once I had him, Pike turned that “foolish slip of a girl” into a strong woman. At least…I thought he had. I close my eyes briefly and push that thought away, forcing my mind back to more pleasant thoughts on the man I love—or is it “loved” now? My Pike was the kind of man you were proud to walk beside. Wherever he went, people loved him, and he taught them to love me, too. We were so different, but so the same. He was so tall, I had to nearly bend over backward to look up at him; I was so short, he spent much of his time hunching his shoulders to kiss me. I shake loose a hook and pick up a blue ball to hang on the tree as I muse. The Moonstone Bay picture brings back fondest memories. Memories of the beach. Of his rough fingers twined tightly in my smoother ones—my hand so small I could hardly close it around his, of sunburn peeling my skin and his soft chuckles as he helped me rub off my snakeskin. Memories of Pike’s tawny head resting on my chest while he napped like a cat in the sunshine. I remember him saying my hair looked like the shadowy sea when the moon glowed on it, sort of soft and blackish blue. He said my eyes reminded him of sad snowflakes, but he never really told me what that was supposed to mean. Snowflakes aren’t grey. Pike was always saying silly things, sentimental boy. Now it’s Christmas, and I’m the one who’s sentimental. I’m the one staring at the splintered glass ball at my feet, seeing his laughing eyes in the shattered navy bits strewn across the hardwood floors. A small sound rises in my throat, something between a sob and a startled shriek. I expect him to come running, calling my name to see if I’m alright. But there’s no one in this big old god-forsaken house he loved—no one but me, myself, I, and Pike’s Christmas lights. Or at least that’s what it feels like, I decide as I glance down at Pike’s puppy again. Hopper pants, tongue lolling out of the side of his mouth. He looks like he’s smiling at me. I wish he would stop smiling at me. I turn away from Hopper and look out the window once more. It’s dark out and the world seems even more empty and desolate than before. Slowly, I set down the hook in my hand, leaving the mess of shimmering glass on the floor and sinking into the corner of the couch. Hopper jumps up with a little bark and climbs up beside me, sitting down against my side. He noses my chest and licks my face, and I wrap my arms around the stupid labrador and hold back tears. Soon, Christmas will pass. Soon, I’ll move on—from this pain, these memories. Soon, I’ll be normal again, and my family will stop worrying. Soon, everything will be alright again, and I’ll forgive the military men for stealing my man from me. But for now, the Christmas lights are still broken—and so am I.